Learn how to ensure your office phone system is NBN ready. Most of us know that NBN means for us faster internet connection and better convenience, but a lot of people are not so familiar with the association of NBN and office phone systems. The good news to these people is that NBN is, in fact, opening a new world of telecommunication opportunity for businesses. 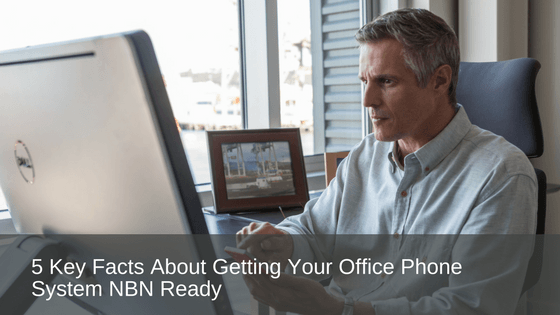 Although not the easiest of concepts to grasp hold of, there are a few key facts about getting your office phone system NBN-ready. To make the transition as simple as possible for you, our team have put together some necessary information about NBN office phone systems for beginners. How does an NBN phone system work? Phone systems that are run off an NBN connection are either referred to as a VOIP telephone system or a SIP service. Unlike previous office phone systems, instead of functioning individually NBN combines your office phone system with your internet service, so they are now like two peas in the same pod. NBN runs off digital data to both send and receive multimedia messages and requires a specialist NBN-ready phone system. It is therefore not compatible with old analogue phone devices. What exactly is an NBN-ready phone system? An NBN-ready phone system can be set up as a hosted phone service or run on a traditional PABX phone system. Hosted phone systems are generally the most popular choice for their convenience, whereas the PABX traditional systems are still a viable option if this is preferred. Hosted phone systems are commonly referred to as VOIP telephone systems, cloud phone systems or cloud-based phone systems. For further detail about the ins and outs of these phone systems, their set up, pros and cons, you might like to refer to our blog articles online here. The NBN speeds when delivered allows better connectivity and access to these systems for everyone. There may be potential limitations for businesses too, and you can read more about that in our online article here. With an NBN ready phone system, you can easily transfer a call to anyone in your team either onsite in the office, or to an external phone or mobile for those who work on the road. If you want the flow of calls to be answered by a specific department within the organisation firstly, you can also set up call flow routes to departments, teams, or individuals. This makes an excellent tool for when you have launched a new product or service, need to take a conference booking, selling event tickets, or have changed procedures or regulations for clients, etc. You can generate customised automated messages so that you callers receive a tailored greeting based on the time of day or night they dial. This is a handy tool especially when you operate on specific hours, and your direct line has been given to certain clients. Now you can welcome your callers with a professional automated assistant that allows them to select who they would like to speak with based on the options that you provide. This is perfect for hospitality customers for example, who offer accommodation, restaurant bookings, functions, and special events, etc. If you run an organisation of a sensitive nature, sometimes it can be beneficial to keep the records of advice which your team provides to your callers. This could also prove especially advantageous for improving areas of service, like customer experience or staff training. You can set up an app on your smart device or computer so that you can receive calls from the NBN hosted phone system wherever you may be. By simply making use of some earphones or headphones, you can work like a pro and stay connected with no fuss! If you want to discuss your NBN phone systems, hosted office phone systems, or Cloud-based phone systems, get in touch with our team online or give us a call on 1800 007 229 or visit www.prosum.com.au we’d love to hear from you. At Prosum, we provide communication and technology solutions to businesses of all sizes, across all industries, right around Australia. With 50 years of expertise, no one knows technology and communication like Prosum. From Hosted PABX and VoIP solutions to cloud-based phone systems, NEC Phone System Support and SIP Lines, we provide expert advice on the communication products and services that will suit your organisations’ needs.